I love visiting churches when I am in Europe. In particular, I like the stone churches. Perhaps this is because of their texture or perhaps it is because we have so few stone churches in North America. It's not hard to get a fix of churches when in Europe. In most European communities, there is a church every couple of blocks. Fulda, Germany, is no exception. Even though it is a very small town, there were several churches, a Cathedral, and an Abbey to investigate. Up before dawn for my usual photo walk-about, I came across this church in the center of town. A construction company was in the process of repaving the square where the church was situated. For the safety of both workers and pedestrians, they had arranged their fencing to protect the work, yet still allow access to the church. To me, however, it looked like a giant "people funnel". The idea of funneling "teeming masses" into this church (or any church) was quite ironic, given we are in an era of steeply declining church attendance. It is hard to imagine any church requiring crowd control. Leaving this church, I wandered up a stone alleyway towards the Cathedral. On the way I passed the Abbey. I didn't get a chance to look inside, as there was a very high stone wall surrounding it and the gates leading inside were locked. This bicycle was backed up, pointed out, and ready to go. I wondered if one of the Abbey's residents intended to use it as an emergency get-away vehicle! Further up from the Abbey was the Cathedral of Fulda. It is a wonderful baroque church that is home to the remains of St. Boniface. I arrived well before dawn and was able to walk around to scope out the best viewing angle to watch the effects of the sunrise on the facade. Here is a panoramic shot to give you a sense of the environment around the Cathedral. Unfortunately, on neither Flickr nor Blogger will you get the benefit of the very large file size and be able to see the detail in this shot. The colours just before sunrise are always interesting. When there are no clouds in the sky to reflect the sun's light while it is below the horizon, the sky becomes a deep blue. I find this colour blue is a nice contrast to the orange glow of the high-pressure sodium (HPS) lights that are typically used to light roads and building exteriors. At least they are typical today. I wonder what it will look like when HPS finally gives way to the much whiter light of LED lights? As is normal when I am out shooting in the morning, there were very few people out. I quite like this because there are no crowds to clutter up my photographs! On my way back to my hotel, I passed a window with these bottles arrayed on the ledge inside. They looked like empty wine bottles that someone had sewn white fabric around and then placed a flower in the neck of the bottle. On the white fabric was a coloured print of a rabbit; each bottle had a different coloured rabbit. I thought this was a pretty cool way to recycle empties! Arriving back at my hotel, I noticed an un-recycled "empty" sitting on a bench across from the hotel doorway. In some photography circles, there is an endless debate about camera specifications and which camera makes the best images. In other circles, there is a cliché that "the best camera to have, is the one that you have with you". The point of the cliché is to say that a camera that is with you but has poor specifications is still better than a camera of good specifications that is left behind. Ever since cellphone manufacturers added cameras to their feature line-up years ago, I have always had a camera with me wherever I go because I always have my cellphone with me. The specifications of these built-in cameras are not very good. However, when an image screams at me to be taken, I can always reach for my cellphone and use the built-in camera to calm the voices inside my head. 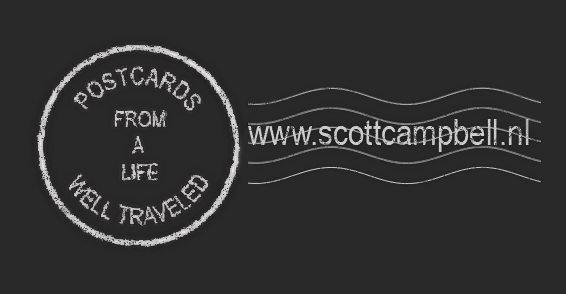 Here is a short post on a moment when I used my only available camera to record a life Postcard. I was out for a pre-dawn run in Fulda, Germany, and didn't realize that conditions were just perfect for a sunrise photo. First, I was out early enough to be in position well ahead of the sunrise. The sun was just about to pop over the horizon, so I was in position for the pinks and purples that happen for the small amount of time just before the actual sunrise. Second, there were a lot of storm clouds overhead to bounce those colours back down to me. Storm clouds always make for a very interesting and dramatic composition. Third, there was a gap between the horizon and the storm clouds. You see this sort of gap when the clouds have only just rolled in and do not yet stretch as far as the horizon. This meant that the pre-sunrise light could actually reach the clouds that I saw in front of me. I was running away from the sun rising behind me. Finally, there was a great composition to use all of this wonderful lighting on. Ahead of me was a field of canola and their yellow blossoms surrounded a lone tree. In the sky above were those storm clouds I just mentioned. I had none of this on my mind, of course. I was only thinking about getting in my 10 kms and heading to breakfast to meet the show team (we were at the Rettmobile trade show). As I have gotten older, I have learned that the voices inside my head are images talking to me. Sometimes they whisper and sometimes they scream. This one screamed at me, stopping me mid-stride. I reached for my phone and quickly grabbed this shot before the moment passed. The next morning, I decided to return at the same time to the same place. This time I would bring my Nikon DSLR. I have a Cotton Carrier that allows me to strap a larger camera to my chest. This carrier is great for skiing and hiking, but I have never run with one until now (if you have one, don't try it - it is not that great for running). When I got to the same point as the day before, the light was completely different. Even though the first photo (which was taken with my phone), is very soft, I find the above photo (taken with a high-end Nikon DSLR) completely lacks any of the drama of the photo from the previous day. For me, this re-enforces the point that a photographer must be able to capture an image when the moment arrives with whatever camera is on hand. When I reached the turn-around point of my run, I noticed this field of unripe wheat. The rising sun side lit the wheat, creating a strong contrast between the tracks a tractor had made in the field and the tops of the wheat. This image called to me as well and since I had a camera with me, I stopped to take a photo. A slide show of larger images is here. I am always inspired to take photographs when I am in Amsterdam. I find the scenery in this city to be very stimulating and I end up taking a lot of photographs on every visit. Also, there are many fabulous galleries and exhibits where the art on display causes me to step back and think about my own work. On this particular trip we took in Museum het Rembrandthuis and the World Press Photo 11 show. These two exhibits inspired me to push my limits and sweat out a new style of shooting, as you can see in the first image above. Angie and I planned to go to the Palace at Dam Square, then head over to the Oude Kerk where the World Press Photo exhibit usually hangs out, and wrap up with a visit to Rembrandt’s House. The Palace, which dominates one end of Dam Square, has been closed for renovations since before I began visiting Amsterdam. I have never been inside it. I have never read any reviews that say it is a stupendous place to see, unlike the wonderful Château de Versailles. However, the constant denial of seeing the inside for myself has built up and actually doing it is now a fixation of mine. On the trip to the hotel from the airport I always ask the taxi driver if the Palace is open. For the past 7 years, the answer has been “no”, but this time I was shocked to hear a “yes”! I was worried that the taxi driver misunderstood my question, which is not uncommon with taxi drivers who do not share the same first language with you. However, as we approached the Palace we could see signs on the fencing surrounding the Palace confirming that it was open. I’m guessing I am not the only one anxious to see inside! Imagine my disappointment, after all of the build-up, to walk around to the entrance only to find a much, much smaller sign announcing that, in fact, the Palace was STILL CLOSED! From Dam Square, it is a short walk over to the Oude Kerk, where World Press Photo 11 was on display. This is a fabulous, inspirational, and disturbing collection of the world’s best photojournalism. Yes, I did say "disturbing". Many of the photos document humanity's ability to intentionally hurt, which is always disturbing. See for yourself at the on-line version of the exhibit here. The Oude Kerk is a great place to host a major photography exhibit with its large space and bright light. Besides looking at the photos themselves, I indulge in a bit of voyeurism and watch for people's reaction as they look at the images. I’m always amazed at the eclectic nature of the audience of this exhibit and am especially happy to see young people in the audience. These photos never cease to amaze me. The ability of street shooters to capture what Henri Cartier-Bresson called “the decisive moment” is very inspiring. To paraphrase HCB, there is a moment in which to make an image and in an instant it is gone forever. There are no studio lights to adjust to get a better composition, only ambient light. There are no models to pose, only a subject who may not even want their photo taken. These photographers do not get any “do-overs”. There is just them, their camera, and what is around them. They can shoot, or not shoot. No one around them really cares. They have to capture what they see in a way that interests others, and they have to do this while in a slightly hostile environment (or sometimes very hostile environment, as we saw with the deaths of Chris Hondros and Tim Heatherington). Painters live at the opposite end of the time-composition spectrum from where photojournalists hang out. Painters create everything, typically in the safe environment of their home. They build their composition from scratch. They add every detail and every lumen of tonal contrast because they want them there. I guess painters have the ultimate version of “Photoshop”. The painters who inspire me the most are the Dutch Masters, Chris Pratt, and Edward Hopper. I find what these artists have done with light and composition very inspirational. I can look over and over again at De Nachtwacht (or more properly titled The Company of Frans Banning Cocq and Willem van Ruytenburch). I never seem to get bored with it. Angie loves Rembrandt as much as I do, so when I discovered that there was a Museum het Rembrandthuis (Rembrandt’s House Museum), there was no question of not going to see it. The lighting inside was very soft, coming from large windows high up on the wall, much higher than you would expect, especially from an era when people were quite short. The exhibits were wonderful, giving me a lot of new insight into his life. You could see where he slept, ate, and worked. I took this one of Angie next to the spot where Rembrandt painted De Nachtwacht. However my inspiration began to turn to perspiration as I tried to take photographs in the style of Rembrandt. After all, it was his house and I thought it only appropriate to do so. Taking a photo that looks like a painting is not an easy job. I have been trying to do this for many years as part of my abstract shooting. On this particular trip, all the pieces started to come together. Here is a shot of the door to Rembrandt’s kitchen. Here is the left side of the fireplace in the kitchen itself. The way the light fell in the kitchen was such that the right side of the fireplace looked quite different. There was no dominant red here, but there was a quite interesting green pot. Upstairs, I learned that Rembrandt assigned the task of making his paints to his apprentices. It wasn’t hard to imagine Rembrandt hovering over these pots of paint, freshly made, selecting which he would use for his next painting. I was quite pleased with this evolution in my still life abstract work, so I tried applying these new techniques to my street photography. Here is an abstract of wooden tulips a sidewalk vendor had for sale. Adding these concepts to the process I use for my nighttime street photography seems like a natural thing to do. I quite admire the style of Edward Hopper, such as his 1942 painting The Nighthawks, and I think this now gives me a technique to emulate his style. By removing details from the scene and adding a swirl of a painter’s brush, I find I am able to add a touch of mystery to the image. What does this guy want? Does the fellow inside know him? What will happen next? A slide show of the photos in a larger size is here.